We walked further than expected today from the Rey Pedro Hostal in Santo Domingo to the first albergue we came to in Belorado. We were hot, tired, and thirsty peregrinos after walking 22.9 km, so why go any further when there is an oasis with a swimming pool and a bar? A swim and a couple of cervezas would make us feel like new again. Luckily Dave has boxer shorts that can double for a bathing suit, but my bathing suit was one of those things purged from my backpack when it weighed more than 13 pounds. Every ounce counts when you have to carry it 800 km. Do I regret purging the bathing suit? Today I sure did, at least until Dave said the pool water felt like it had come from a glacier. This albergue is far enough from the busy highway, which bodes well for a quiet night’s sleep. Our dormitory has four bunk beds, with only six beds occupied. With any sort of luck there are no snorers amongst us. We’ll soon find out, because peregrinos tend to go to bed not long after dinner. It is a strange tribute to Saint Domingo who did so much to assist pilgrims to reach Santiago de Compostella that at least half of today’s walk is parallel to a very busy highway. Endless streams of semi-trailer trucks hauling goods mostly to the north-east were zooming past. Traffic was worse than at any other stage of our journey so far. There was no shelter from the hot sun or even water except from the little villages we walked through. 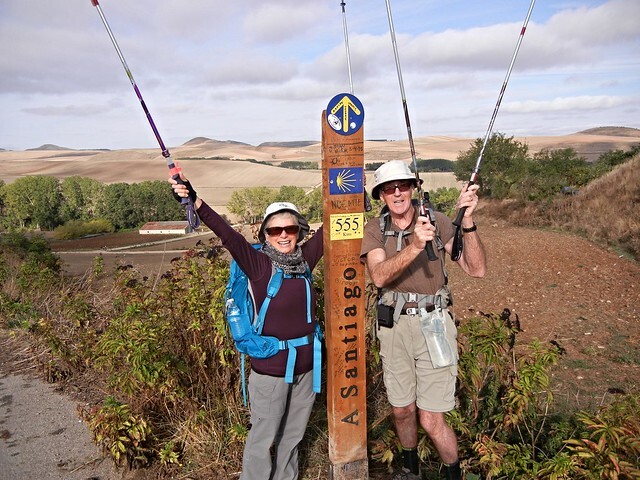 The Camino wound its way through five little villages between Santo Domingo and Belorado. Three of the villages (Redecilla del Camino, Castildelgado, and Vilamayor del Rio) are alongside the busy highway, so they wouldn’t be the best choice for ensuring a quiet sleep. Two of the villages (Granon and Viloria de la Rioja) were away from the highway and much more tranquil. The first village we came to was Granon. It was a peaceful place where we stopped to have breakfast after walking 7.2 km. Granon is a walled town set back from the highway on a hill. It was inspired by the Camino and had two monasteries and a pilgrim hospice. We usually fill up with water when walking through the little villages – usually “potable” water, but not always! Today Dave was helping himself to “non potable” water at a fountain in the central square of one of the little villages. I came along just in time to draw his attention to the “non potable” sign posted at right angles to where he was filling his water bottle. As Dave was busy dumping out his water, I noticed the incident hadn’t gone unnoticed amongst the peregrinos resting in the shade who seemed amused by this incident. 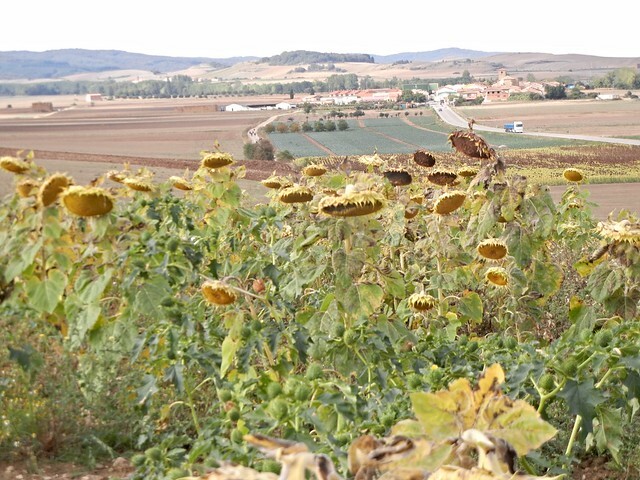 Soon after Granon, we crossed the border between “Rioja” and “Castilla y Leon.” Rather than the grapes of Rioja, cereal crops hold sway here. It is a sparsely populated, arid region with gently rolling hills. Delightful villages are seemingly uneffected by the speed of modern life. Thank you, thank you, thank you so much for all the words of encouragement from back home. We love to feel the connection with everyone at home and are so glad you are on this journey with us, albeit vicariously. We are sending you all love from the Camino! Yaaaay!!! You found the 5’s! I was worried. Granon, the little village where I got the rock from the Spanish man. “If you need anything, ask the rock,” he said. Then I came to the 555 km to Santiago post. “Let go of the old.” echoed in the back of my mind. Lol! Memories. So have you lost weight over all of this exercise? Yes! So much that I now have to use those skinny little ties that you often find at the waist of active wear. I never used them before but now I do so my pants don’t fall down. LOL! No need to watch “The Way” yet again – we can travel with you daily – as you say Judy, vicariously. How do the numbers of Peregrinos compare? Have you spotted many of the sites? Of course you can compare with Tania’s so well-recorded experiences. Have you sung songs over dinner and wine? The svelte Judy will be the envy of all her friends. Shows how much exercise need to shed a few pounds! Well, that settles it. 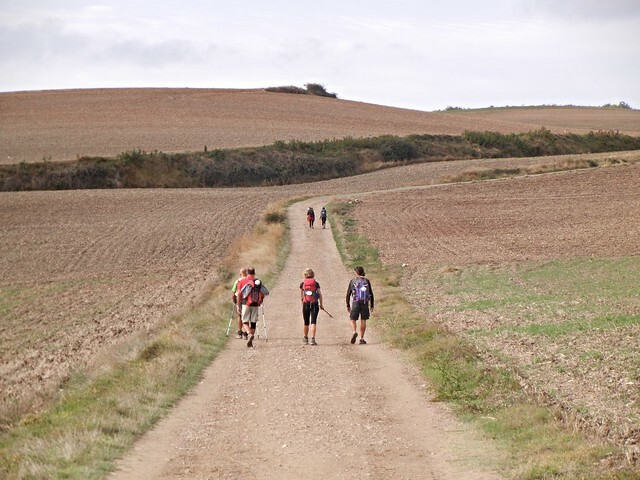 I’ll have to walk the Camino. Weight loss and emancipation! A pretty good deal, I’d say. Any Sherpas for hire? All your bridge pals are so enjoying your posts. Keep on trekking! It sounds and looks wonderful. We’re enjoying all your posts. 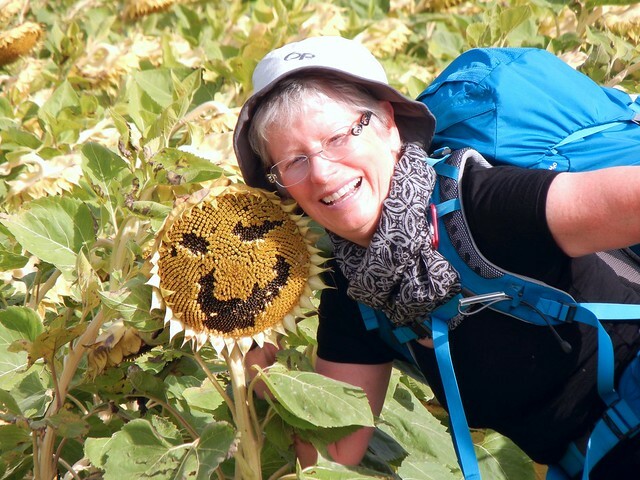 Love the picture of the grinning pair, the sunflower and our tracker. Liked it so much I had to show it to Ken. Be careful about losing too much weight. When you turn sideways do you cast a shadow? As long as you can see your shadow I guess you’re still OK.